Daria and her friends call themselves "the authentics" -- kids keeping things real by being honest about who they are to themselves and to each other. For Daria, that has meant embracing her identity as an Iranian-American living in Beverly Hills. And while she is not as rich or as pretty as a "Persian princess" (at least, according to her former best friend Heidi), she is proud of her ethnic identity. So when she discovers that she is in fact adopted and maybe not Persian at all, she is crushed. She seems to belong nowhere and to no one. How can she possibly be true to herself? But in the end, she comes to realize that identity and family are fluid concepts and not tied to a fixed idea. One can be authentic without any sort of label. 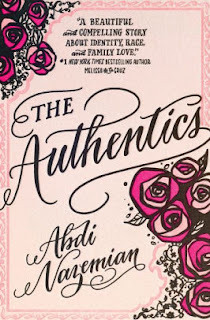 Full of lots of fun observations about Southern California Iranians and some much more nuanced observations about ethnicity, family, and adoption, there's a lot swirling around in this book. I could have lived without the fairy tale ending, but I enjoyed so many other things in this story: the frankness and strength of Daria herself, the realistic tension between Daria and her mother, the exploration of adoption and how adoptive families compare with biological ones. And, as already mentioned, I loved the peek into the culture of Iranian Americans.